As the Co-operative Group (Co-op) prepares to move into its new head office in September 2012, the firm's IT team is on track to virtualise up to 3,500 desktops and merge some departments to drive cost savings. Around 3,000 Co-op users are currently running Citrix's XenDesktop across the company's personnel and banking operations in the head office. The company has been using Citrix's XenDesktop for nine years, but the next phase of virtualisation will make all of Co-op's applications independent of the operating system (OS) it is running on. Ian Cawson, technical architect at the Co-operative Group, said the company plans to virtualise up to 2,000 desktops by the end of 2011. By 2012, he hopes this number will reach 3,500 desktops across its head office and funeral services branches. In addition, the Co-op will roll out desktop virtualisation across its financial and resell departments to centralise applications that are packaged separately to create a shared environment for support to provide cost savings. Britannia Building Society and The Co-operative Financial Services (CFS) merged in August 2009. Over the past two years, the companies have started optimising joint business operations and introducing virtualisation. This forms part of the company's transitional phase, which will combine its financial and retail services arms in a project called Project Unity. Co-op has been using Citrix's XenDesktop platform for over nine years. The company started virtualising desktops in 2009 to help reduce power consumption. 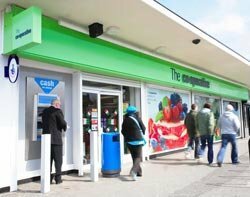 In January 2011, the Co-op predicted it will save more than £1.5m a year on simplified desktop maintenance and support, a further £500,000 a year on reduced energy costs, and will be on target to meet its commitment to a 35% reduction in the group's carbon footprint by 2017. A recent Ovum CIO survey found that simplifying the management of desktops to reduce costs and provide business agility were the two main reasons for implementing desktop virtualisation. Cawson said it took a year to roll out the initial virtual desktops after creating a business case. "The year-one costs are normally quite extensive, but over a five-year period the model is really compelling. It's the third year where you get the savings, primarily on the energy side and reduction in support mechanisms," he said. Costs for the Co-op involved replacing its entire environment to support desktop virtualisation. Part of the Co-op's business case was building a new environment based on a new HP ProLiant server and the use of Fusion I/O storage supported in a blade enclosure. Approximately 100 virtual desktops can be used per server. Cawson said that after a break following the first roll-out due to financial reasons, the company is continuing its desktop virtualisation project. Despite upfront costs, he said companies should avoid delaying business cases for virtualising desktops. "Just do it. If you don't spend, you'll have a longer wait and experience a longer wait to get payback," he added. Cawson said companies can also treat virtual desktops as a service model to eliminate capital expenditure. Managing licences was key to the project. The Co-op uses AppSense's Environment Manager and Application Manager as part of its Citrix XenApp environment to standardise its management tools. Cawson said the management tool helps look after applications to meet any governance and compliance issues around licensing. The company decided to use AppSense's Environment Manager and user personalisation instead of XenDesktop directly to provide "greater control and granularity". "AppSense Environment Manager delivers a personalised experience every time our users log on, making it impossible for them to decipher between a traditional PC and their virtual one," he added. The company recently signed a Microsoft EA (enterprise agreement). "We signed an EA agreement to tie into how we're distributing apps. It's the first time we've moved to EA and it's taken 18 months. Over the next three to four years, we're going through a transitional phase and there are financial benefits to doing it," he said. Cawson said the company trained staff to use virtual desktops using video case studies shown to department "champions" who then trained everyone else in the department. "The challenge was that it was a cultural change. But the video case study training worked really well," he said. The company is about to start trialling a Microsoft Windows 7 deployment and is using AppDNA to decipher potential migration problems with particular departments, as well as predicting costs. Cawson anticipates legacy applications, such as 16-bit Windows NT, will be more difficult to migrate to Windows 7. The first pilot will be rolled out in October 2011. Carson said "80% of applications pose no problems", but it will be a learning curve as "things are changing all the time". Read how West Nottinghamshire College tamed Microsoft Active Directory for desktop virtualisation.